Claiming to offer ‘contemporary barbecue cuisine prepared in the classic Cali style’, Big Sur seeks to fill a niche no one cared to realise existed. The atmosphere is a little lacking when we rock up on a Wednesday evening, the pale wooden table and chairs making it look more like a classroom than a hip, new eatery. Wood panelled walls dressed with pictures of the California coastline add a little character but things are more lively outside where high tables and heaters sit right on Staunton Street, so we decide to dine al fresco. Or at least we try. Unfortunately, the restaurant’s license to serve customers outside is yet to arrive, so for now there exists an awkward system where staff bring drinks and food as far as the door and guests have to collect them from there. We put this down to the birthing pains of soft opening and remain open minded. We peruse the drinks menu. Big Sur has a special collaboration with Young Masters Brewery so there’s a good range of their craft beers on tap, as well as a cocktails, fresh juices and a range of global wines – surprisingly, only a handful from California. 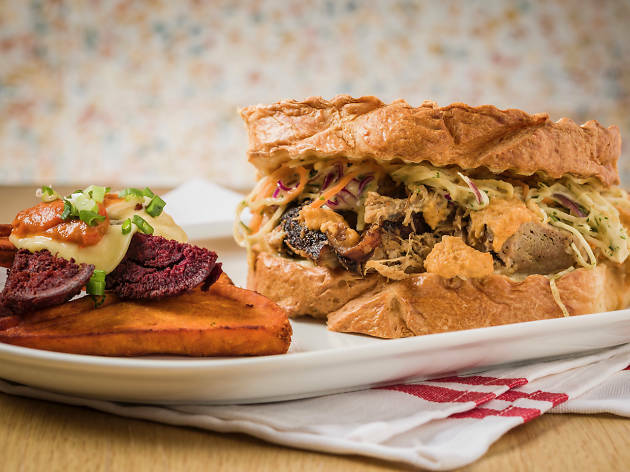 A look at the menu reveals a mix of Southern barbecue and South American dishes – the Santa Maria tri-tip ($190, after 5pm only) is just about the only sop to real California barbecue. That’s not to say there aren’t tempting options, though. The charcoal grill is home to items like marinated halibut ($190) and herb haloumi ($130) or, if you prefer your delectables smoked, there’s whole barbecue sea bass ($470) and Memphis pork ribs ($230). We start with hamachi ceviche ($145) followed by soft ‘baja’ tacos ($165) from the grill and a barbecue pork plate ($215) from the smoker. The ceviche is a refreshing start, cubes of marinated fish complemented by garlic and avocado pureés and crisp tortilla chips. The textures and flavours complement each other well apart from the fresh parsley, which jars and might have been better replaced with coriander. 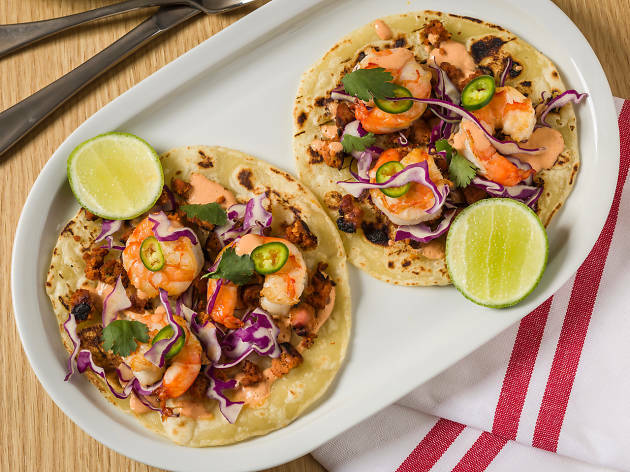 The tacos are stuffed with plump prawns, shredded cabbage and a baja sauce that injects some zing and spice. The bundles are well-balanced but $165 for three small tacos is a little steep. The distinctly Texan barbecue plate consists of pulled pork, pork ribs, coleslaw, barbecue beans and cheese popovers, with a ramekin of barbecue sauce in the middle. The pulled pork isn’t bad and the ribs, though pleasantly smoky, are a little dry – a hazard of slow smoking. The popover proves to be, basically, a Yorkshire pudding with cheese melted into the top. Fine, but nothing special. The slaw lacks the acidity which is surely its job to provide but, fortunately, the barbecue sauce saves the day. After a good slathering, everything starts to taste better.